I've yet to catch up with the entirety of Aharon Keshales and Navot Papushado's Rabies (review) but the buzz coming off of that movie was enough to fully support their follow-up. 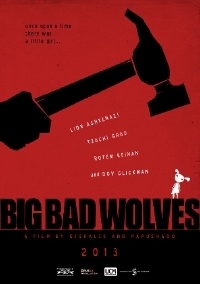 Except that Big Bad Wolves has garnered its own share of accolades over the months before arriving in Vancouver. The story of Big Bad Wolves is actually very run of the mill. A series of brutal murders have left a number of young girls dead but with his newest victim, Dror, the suspect, may have made a grave error. The missing girl's father Gidi is not one to sit idly by and when it looks like the police are going to let the main suspect go, he takes matters into his own hands and kidnaps Dror for questioning. Miki, a disgraced cop on his own trail of redemption, tracks down the suspect to Gidi's newly acquired country home where he is thrown together with the blood thirsty father as the pair try to find the missing girl. As with Rabies, Keshales and Papushado's movie is a well oiled, great looking thriller. The pair are hugely talented behind the camera, delivering a movie that looks sharp and well polished and far more accomplished than I could have expected from a second feature. Borrowing heavily from a number of different genres, Big Bad Wolves feels like it owes a lot to Sam Raimi's early work, a mix of comedy and horror with an undercurrent of violence. Much of Big Bad Wolves unfolds in Gidi's basement with round upon round of torture that would make Eli Roth squeal with glee. The scenes of torture are perfectly balanced, Keshales and Papushado know exactly how much their audience can take before they lose interest or become too disgusted to continue with the story, and the movie walks this fine line throughout, perfectly balancing the various elements to deliver a movie that is not quite a horror movie, not quite a thriller and not really a comedy but a mix of the three. In truth, Big Bad Wolves isn't new but rarely do we get to see a movie that, on the surface, looks and feels like a mainstream thriller but which, at nearly every turn, goes against the grain. Some of the laughs are inappropriate, some of the violence is really over the top and there are moments that really shouldn't work but do. What's more is that buried under all of the genre contraptions, there's also a heartfelt story of a father desperate to find his daughter and a rogue cop who plays outside the reach of the law but who hasn't lost sight of the fact that the detained man might be innocent. Morality play aside (though it is present), Big Bad Wolves is hugely entertaining, a thriller that occasionally steps into horror territory and which isn't afraid to throw in a few laughs for good measure. See it if you can!